"Patrick" redirects here. For other characters with the same name, see Patrick III or Patrick Ligner. Patrick "Packie" McReary (Irish: Pádraig Mac Ruairí) is a character in the HD Universe appearing in Grand Theft Auto IV and Grand Theft Auto V. Packie is a 29-year old member of the Irish Mob and the youngest brother of the McReary family. He acts as a boss, partner, and friend in GTA IV, and as a gunman for hire in GTA V. Once the player has Packie's friendship and respect percentages to a certain level, Niko may call Packie and request a car bomb. Packie will leave it in the player's general location, and once picked up it may be attached to any vehicle and remote detonated via cell phone. Packie was born to Maureen McReary, at 44, and the head of the Irish Mob. His siblings consisted of brothers Derrick, 23, Francis, 15, and Gerald, 6, Kate being born in the following year. Born and raised in Dukes, he has never been outside Liberty City, except for Alderney State. Packie's father was a violent, perverted alcoholic whom Packie blames for their Mob's fall from influence. He says of his father "I used to think I loved him, but then I realized I hated him". He eventually admits to Niko that his father molested him and Gerry. He has been using drugs since he was 14, also staying home from school to roll joints for his dad. He has an addictive personality (not quite as bad as Derrick, but a rising issue), as seen in his predilection for alcohol and cocaine. He began a life of crime very early, having chosen Gerry as a role model, and was arrested for stealing a car when he was 18. In 2000, when he was about 21, his father died - possibly a suicide, or by Gerry. Packie, on the surface, portrays himself as strong and without feeling. But when drunk or otherwise confiding in Niko, he is shown time and time again to be suppressing deeply painful emotions. For example, he will lament that "the world is ugly and unkind", question what being a man is all about, and contemplates suicide. He doesn't seem to seriously consider immediately and directly killing himself, but does glamourize the idea that he will die young of a drug overdose. Compared to Niko, Packie is equally capable of violence and criminal activity, and feels less guilt. He does, however, still hold certain moral standards; If you kill too many hostages during the mission Three Leaf Clover, the mission will fail and Packie would say that he doesn't take this bloody money. By the time of GTA IV, Packie largely operates independently of the Irish Mob, committing stick-up robberies with his friends Michael and Gordon , and working as a hired gun for the Pegorino Family. After the bank job, Packie continued working with and befriending Niko, particularly in the kidnapping of Gracie Ancelotti for Gerry. Unbeknownst to Packie, Niko murdered one of his brothers. Nonetheless, Niko's assistance in suppressing an attack on the funeral cemented their friendship. Packie trusted Niko enough to encourage him to date Kate, the youngest of the McReary clan (confident that Kate would not "put out", in any case). 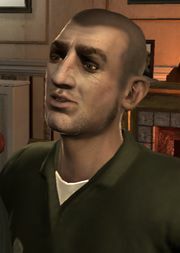 It is revealed in the credits for The Ballad of Gay Tony that Packie left Liberty City with a duffel bag on a flight to Southern San Andreas. It would be his first flight, as he tells Niko during a friendship activity that he's never been outside the Liberty/Alderney metro area. Packie appears in GTA V as a random character encounter robbing a drug store. He can either be killed or you can assist his escape, after which he will become available as a crew member for heists. By 2013 Packie is still doing coke as he boasts after the Jewelery Store job that he's going to do a bunch of rails that night. Depending on the player's choices, Packie can die in a heist or make it all the way to The Big Score and earn nearly $25 million. Eugene Reaper - Packie and his brother Derrick kill Reaper in retaliation for murdering Michael Keane. Affiliations: Linked to Irish American Criminals in Dukes and the Alderney based Pegorino Crime Syndicate. Youngest brother and employee of Gerald McReary. Suspected in a number of robberies and hijackings. Arrested with several grams of cocaine in the presence of a known prostitute. Believed to be working as muscle for the Alderney-based Pegorino Crime Syndicate. According to his brother Gerry, Packie has a tattoo of his own name on one of his arms. It may be his left arm as this is the one Gerry points to on himself. Patrick has a large scar running horizontally under his left eye. In an Easter egg, if you position the camera in such a way that you can see inside Packie's head, you will see a small cube with a picture of a brain on it (all views; top, bottom, front, rear, left, and right), which in fact is Packie´s balaclava texture from the bank robbery. Following the Bank Robbery, Packie purchases a bright red Comet, which is revealed when Luis and Tony Prince are following him around in a Helicopter in the mission Ladies' Night in The Ballad Of Gay Tony. When Patrick gets on a motorbike, he will often wear a dark Irish green helmet. Packie sings Danny Boy during one of the drinking dates with Niko. In The Ballad Of Gay Tony mission Ladies Half Price, the player can go back and kill Niko Bellic and Packie , although they both have an extraordinary amount of health. Neither death will effect the storyline, however. Packie's favorite radio station is Liberty Rock Radio 97.8 and he will respond positively if it's turned on in the car. He also wants it to play at his funeral. He appears to dislike playing darts, complaining that it's boring. He'll also complain if he's beaten at bowling and other games, and will also shout at Niko if he drives too slowly. None of this impacts the positive outcome of a friendship activity. Sometimes when Niko calls him to hang out with him, he may be near the Alderney State Correctional Facility, assuming he was seeing his brother Gerry. His special ability, the car bomb, may be a sly reference to the Northern Ireland conflict, seeing as Packie is of Irish decent. During the conflict, the IRA carried out over 100 car bombings. After the events of GTA IV, he is seen with a bag and heading to the airport. It has been confirmed that he left for Los Santos, San Andreas. During his first appearance in Grand Theft Auto V, he and his associate are arguing after a robbery has gone wrong. The associate complains that he's sick of hearing about Packie's family, friends, and that bank job. Packie will also mention these subjects in The Paleto Score mission, if he was chosen as a partner earlier. Patrick McReary during The Jewel Store Job in GTA V.
This page was last modified on 28 December 2014, at 21:14.